18 Days and Counting, Y’all? How are you doing on your Christmas shopping? Better than me, I hope! The only things I have checked off are the things I’ve run across online. I try to avoid the stores at this time of the year; I’m not a fan of busy stores or crowds. Unless they’re at Hobby Lobby; that’s a store always worth braving the crowds for. 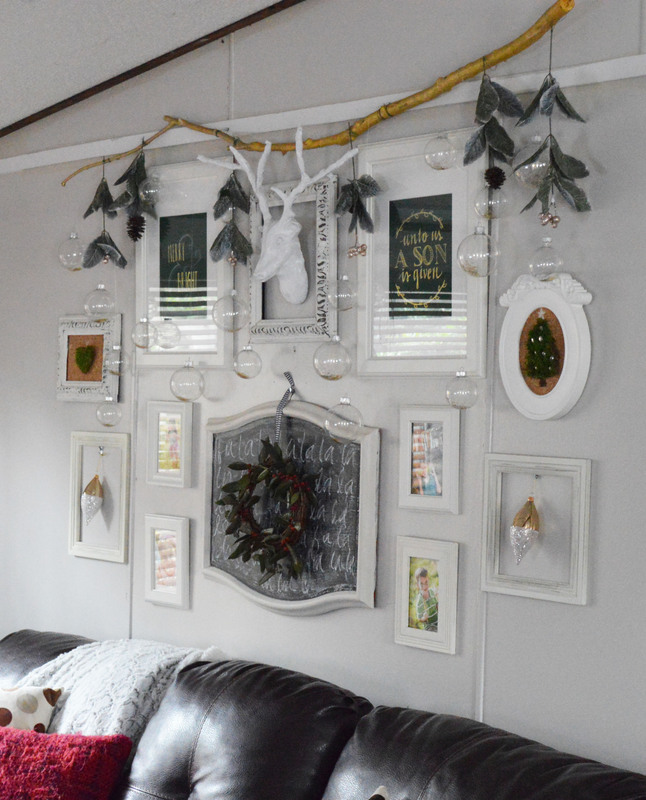 If you’ve read my blog before, you’ve heard me bemoan the fact that we don’t have a whole lot of space in our teeny tiny trailer. In a lot of ways, though, that has been a good thing for us. The thing about this small space that I love best is that we’re all always close together. Also, it’s much faster to clean. Not that I keep it that way, but when it does get really messy (particularly when I’m crafting), I can clean the whole house pretty quickly. Because of this lack of space, for the past several years, we haven’t had space to put up a full sized tree. And each year I think to myself that I need to come up with a creative alternative to a Christmas tree. So this year, I’ve come up with an idea within my copper and marble theme (you can see gift-wrapping ideas here) to display a “Christmas tree” that doesn’t take up any floor space. I started with inexpensive IKEA frames, I think they were $1.50 each, and cut out squares of myCon-Tact Brand Creative Covering Self-Adhesive Shelf and Drawer Liner, 18-Inches by 9-Feet, Marble White “> marble ConTact paper from Amazon to go in them. I took the glass out of the frames, so that I could push a thumbtack through the paper and the cardboard back of the frame to hang my ornament from. The ornaments are from Walmart; I got a big bucket for around $5 and spray painted them copper, then used fishing wire to hang them from the thumbtacks. The greenery garlands are from my front yard. 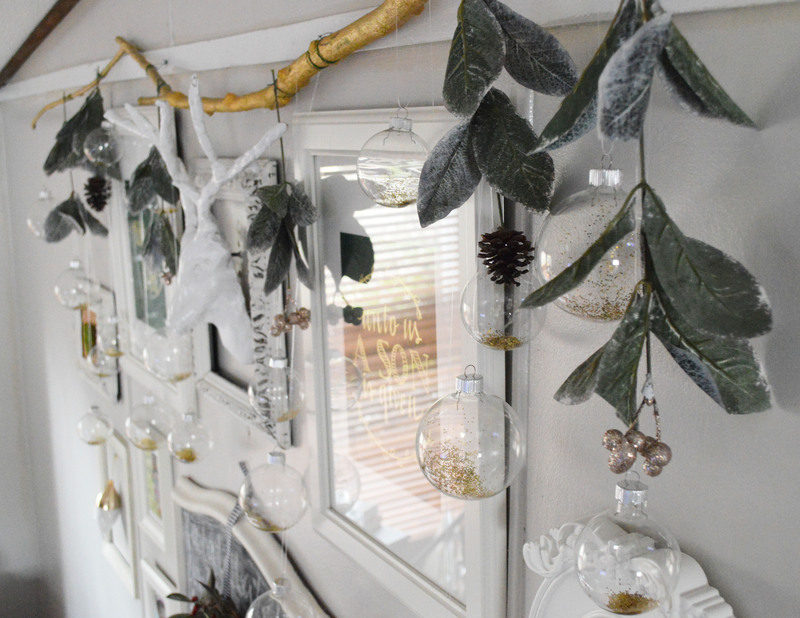 I clipped sections off of an evergreen bush and strung them together with floral wire. Then I used small Command hooks to secure the greenery on the wall. The star topper is from the Dollar Tree. So, I hope you enjoyed this quick little tutorial, and hope that it inspires someone else out there who is as “space-challenged” as I happen to be. 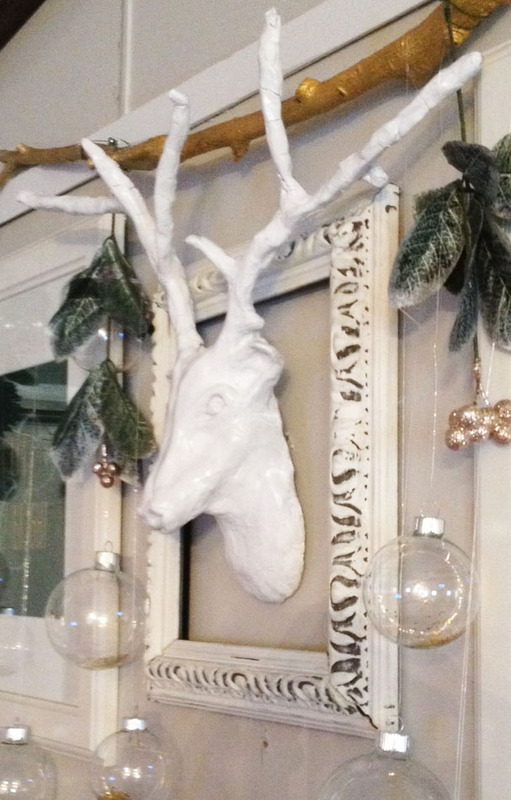 Have a great day, and I will be back with more DIY marble and copper Christmas ideas soon! I’m also sharing this project over at Remodelaholic. Christmas is just around the corner, y’all! 24 Days, to be precise. Are you the kind of person who has had your shopping, wrapping and decorating finished for a month now, or are you the kind of person who is scrambling to cross off your entire shopping list on Christmas eve? I fall into the latter category. But I get really into gift-wrapping, almost more than shopping for gifts, even. 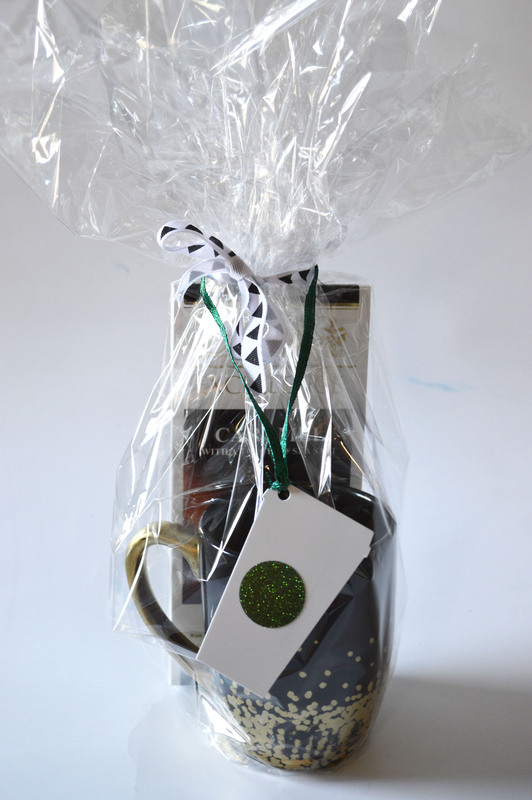 Gift wrapping is so much fun, kind of like scrapbooking, with endless combinations and chances to get creative. I’ve chosen copper and marble as my theme this Christmas, and I’m excited to show you a few gift-wrapping combinations I’ve come up with to inspire you as you’re wrapping your gifts. I knew exactly what I wanted, but had a really tough time finding the copper and marble wrapping paper I had in mind. I ended up using Con-Tact paper that I found on Amazon, and I just cut strips of it to use as accents over my wrapping paper. The best investments, though, were the washi tape and copper leafing pen I used, because there’s just an endless variety of patterns and prints to be made with them…stars, names, Christmas trees, or any number of geometric prints. As you can see above, I used the copper leafing pen to add stars, and to scribble the copper marble look onto black paper, and used little strips of washi tape to make the geometric pattern. Now, if I could give you one tip to take away from this post, it would be to always, always, always use greenery…from your backyard, the side of the road, your grandma’s house…wherever you can find it. Greenery is the perfect (and free!) finishing touch that really completes any wrapping job. Oh, and I’ll let you in on a little secret, which probably won’t surprise anyone who knows me. All of these boxes are empty (insert ashamed face). But I will be using them in my décor, so it’s not completely in vain. 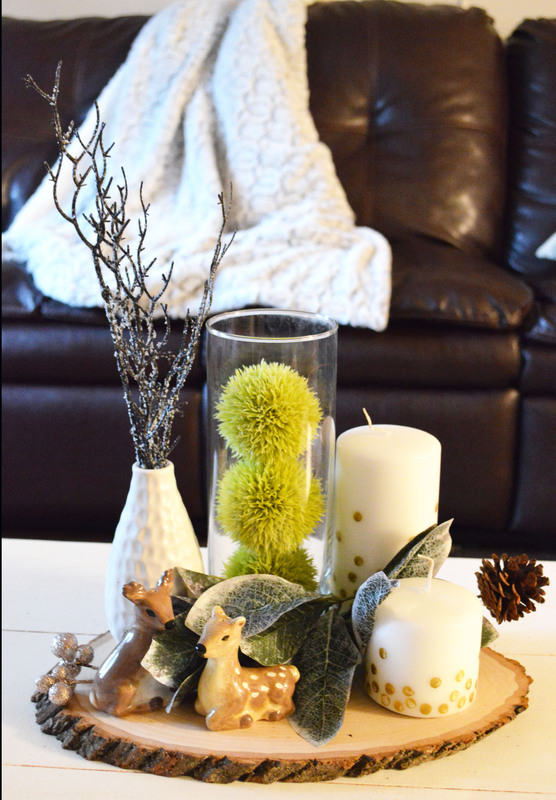 This year for the Christmas season, I’m giving myself a bit of a breather from decorating and blogging so I can actually enjoy the season, and I’m just not going all out on my Christmas decor. 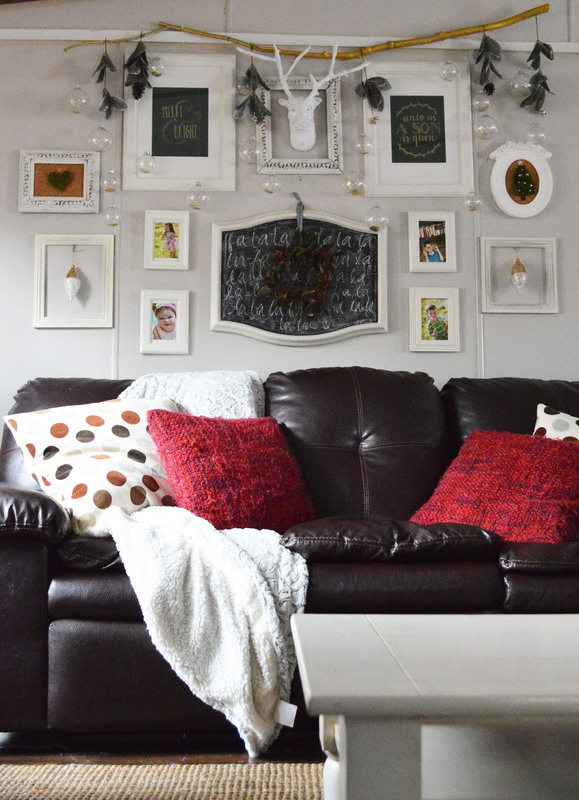 However, I will be sharing a few little corners of my house that I’ve spruced up a bit just to make it a little festive and keep the kids happy. Last year around this time, I was so excited to get my first Stendig calendar, and I had big plans for displaying it in my kitchen. However, I forgot to measure it, and it turned out that, sadly, it was too big to display anywhere in my house. I was very disappointed, especially because it was kind of a splurge for me to spend that much on something for my house. Then, just a few days ago, I had the idea of incorporating it into my Christmas décor. So now, I am very happy to say, my beautiful Stendig calendar has gotten some use; not in the way it was designed, but it still makes me happy. I used a page from my calendar to make a sort of a modern, design-friendly artwork with a bit of a play on an advent calendar. I laid out my calendar page and picture frame, and measured the size I needed and placement I wanted with my picture frame. I grabbed a $.99 tube of green glitter glue from Walmart and outlined and filled in the 25, just to give it a little pop and emphasize the date for Christmas. After letting it dry thoroughly, I cut out my artwork and put it in the frame. I just love the bold, modern, graphic black and white look of the Stendig calendar, and since my front room already has lots of black and white graphic elements, I knew it would be perfect for that room. 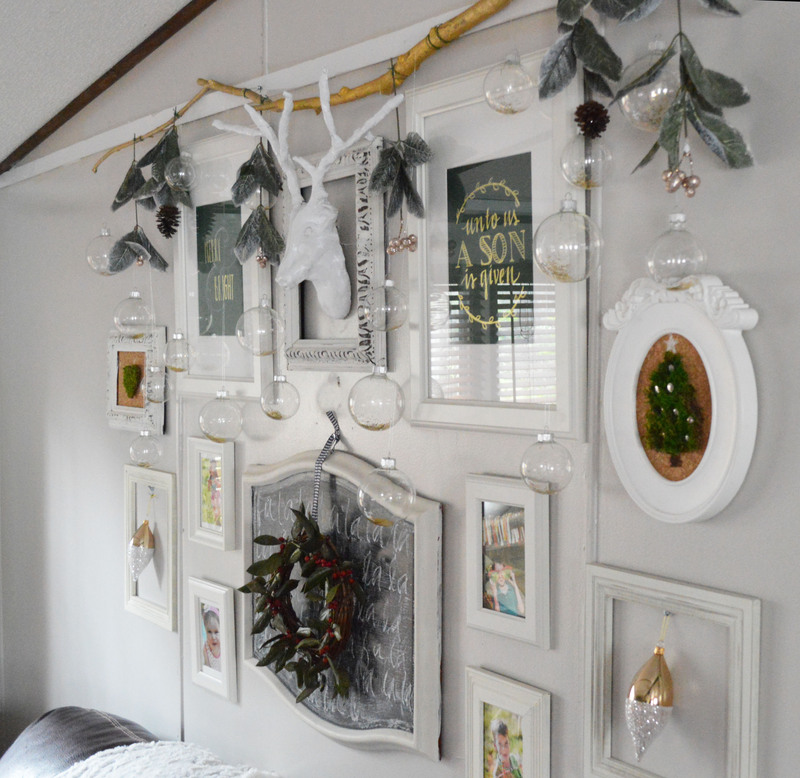 I chose to display it on my Design Sponge inspired closet door, and added some bright, colorful ornaments with baker’s twine where my air plants used to hang. You’ll notice I also put peace on earth, so…you’re all welcome for that. If you like this idea but don’t have your own Stendig calendar, you’ll be happy to know that, with just a few simple supplies (black paper, a cheap stencil set, a chalkboard marker, and a $.99 glitter glue tube…all from Walmart), you can make your own Stendig-inspired Christmas art. …and fill the letters in with your chalkboard marker. Lastly, go back over the 25 with your glitter glue. 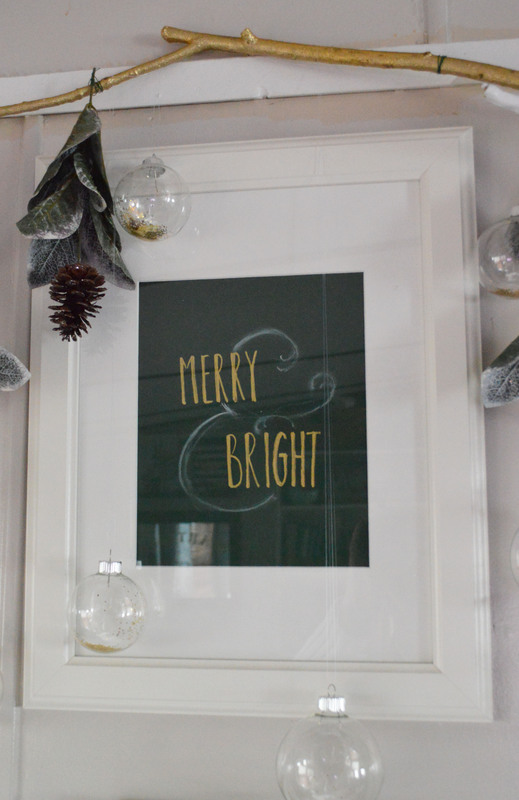 Allow to dry thoroughly, frame it, and you have some really cute, modern Christmas art to display. Mine took me just about 30 minutes. So, there you have it! 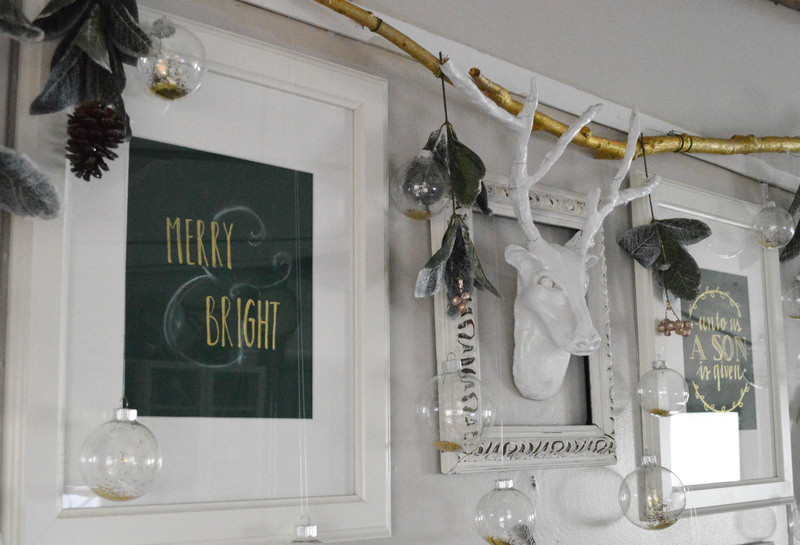 I’ll be bringing you a few more quick and easy decorating ideas like this one in the next few days, so stay tuned! Hope you’re enjoying your Christmas music, shopping, and peppermint mocha lattes as much as I am! 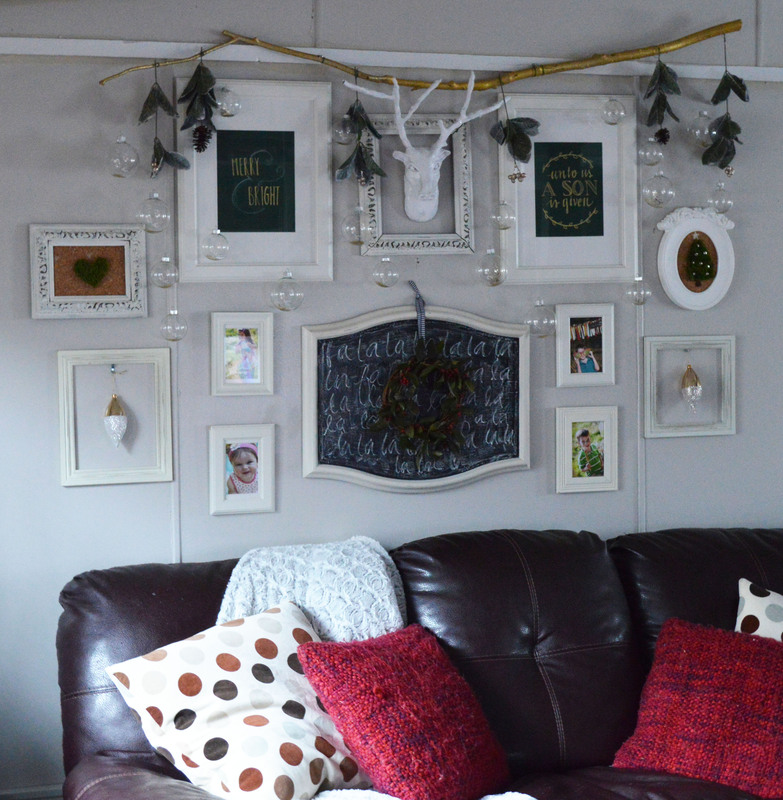 I’m also sharing this project over at at http://www.remodelaholic.com. This is the time of year that I go into panic mode. We will be leaving in a few days to travel to three different states, and my to do list is out of control. However, I’ve done most of my in-store shopping, the rest can be done online, and I have one more little corner of the house decorated! 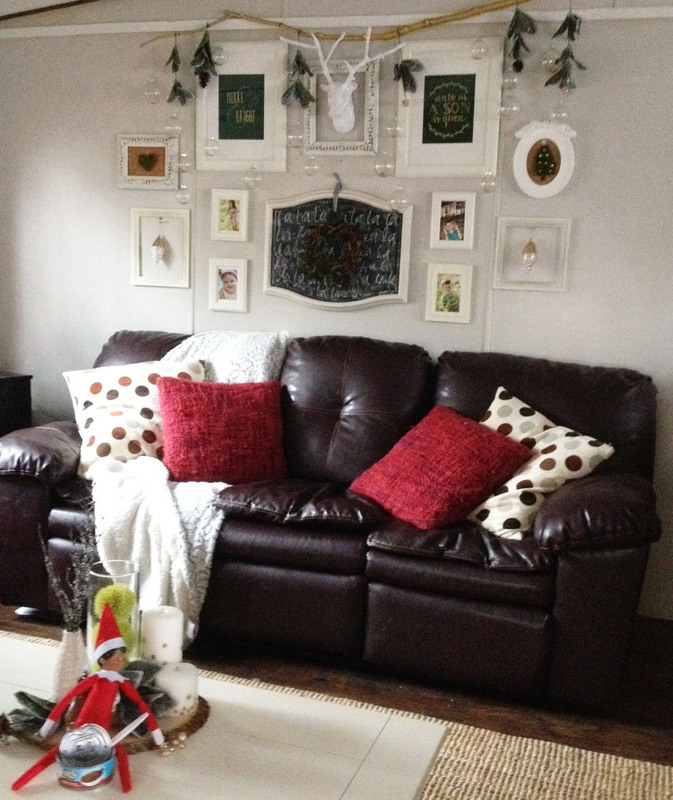 I’m excited to show you my Christmas Gallery Wall. Just about everything you see here is a DIY project, right down to the deer head. Actually, correction, my husband has informed me that I am no longer allowed to call them DIY projects, I now have to call them DIYWYHH (Do It Yourself With Your Hubby’s Help). I’m a little ashamed to admit that I am terrible at hanging things; in fact, I don’t really know how, so he hangs all of my crazy projects. Back to the Gallery Wall, I’ll spare you ALL of the details (unless you really want to know), but here’s a little run-down. First, the chalkboard. 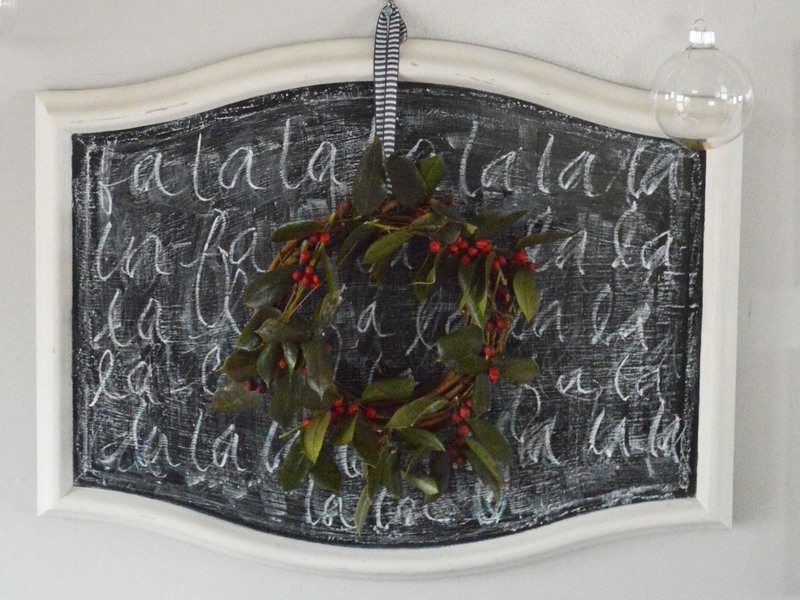 This used to be a brown mirror given to me by my sister, and I always loved the shape, but just couldn’t ever make it work, so I turned it into a chalkboard (a few coats of chalkboard paint and white for the border). The wreath is made from a simple wreath form from Hobby Lobby, floral wire, holly from my front yard, and hung with ribbon from Target’s dollar section. This was my first wreath ever, so I’m kind of proud of it. 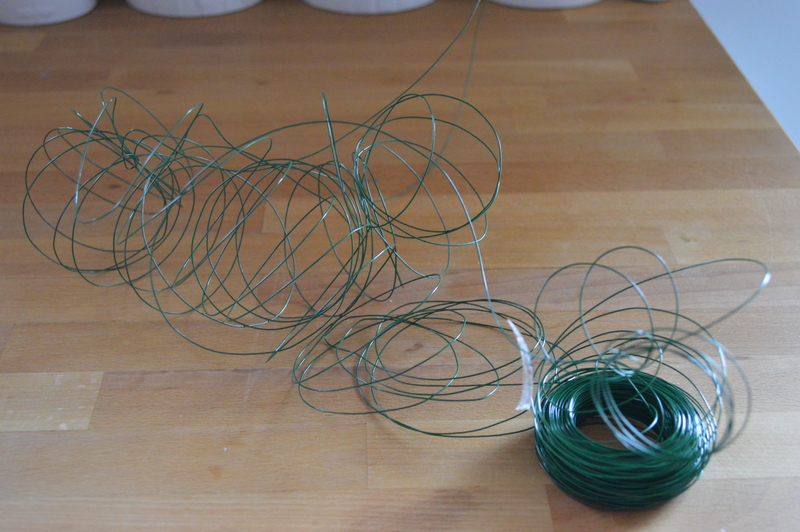 However, this is what happens when I use floral wire. DIYWYHHing is messy business. Or maybe it’s just me. The state of cleanliness at my house right now would definitely prove the latter. I would love to hear from some of you veteran wreath makers out there; any tips or tricks you’ve learned would certainly make my life easier. These pictures were done on hunter green scrapbook paper and that awesome gold glass paint marker I mentioned here. 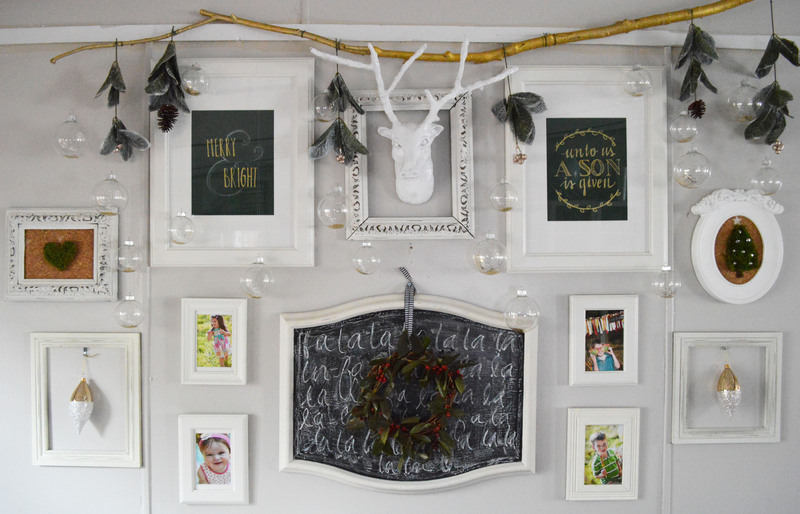 The frames are from IKEA; I stock up on their frames anytime I can get there because they are so cheap and versatile. 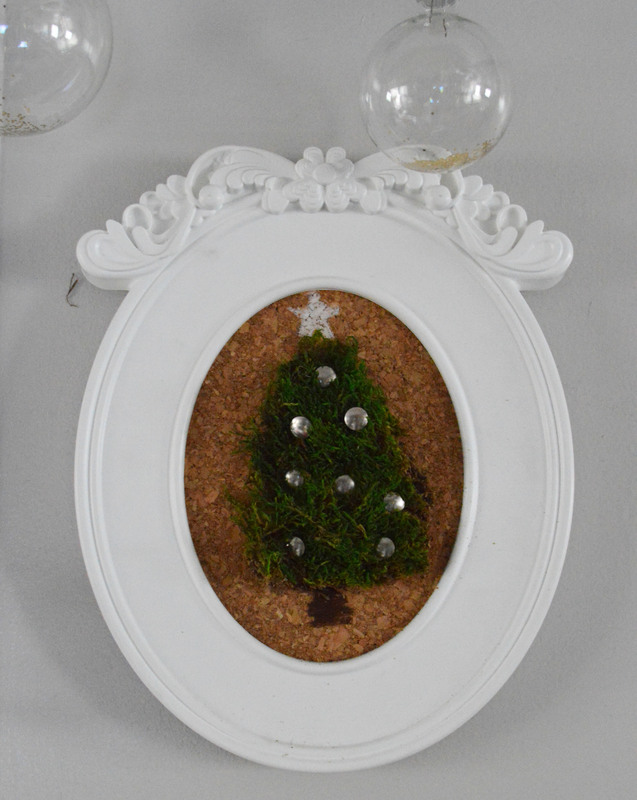 Here’s another IKEA frame with corkboard, a moss triangle, and silver thumb tacks. This deer head was probably one of my crazier projects, but I love it. While I probably could have easily found a real deer head from the taxidermist down the street (yeah, we live out in the boonies) or from an Eastern Shore Marylan redneck relative, I prefer the non-hunted variety, but haven’t found one any cheaper than $50. That wasn’t happening. My version was $6 (Crayola Air Dry Clay, sticks and spray paint), but I’m going to be really honest and tell you that, if you want one of these, you’re better off saving to buy one. My version isn’t for the faint of heart. I was just desperate because I knew exactly what I wanted, and desperate times call for desperate measures, right? Lastly, the branch with ornaments. I stole the perfect branch from my parents’ house (sorry Mom and Dad!). To be fair, they’re not in the habit of reusing their fallen branches, so I don’t think they’ll mind. 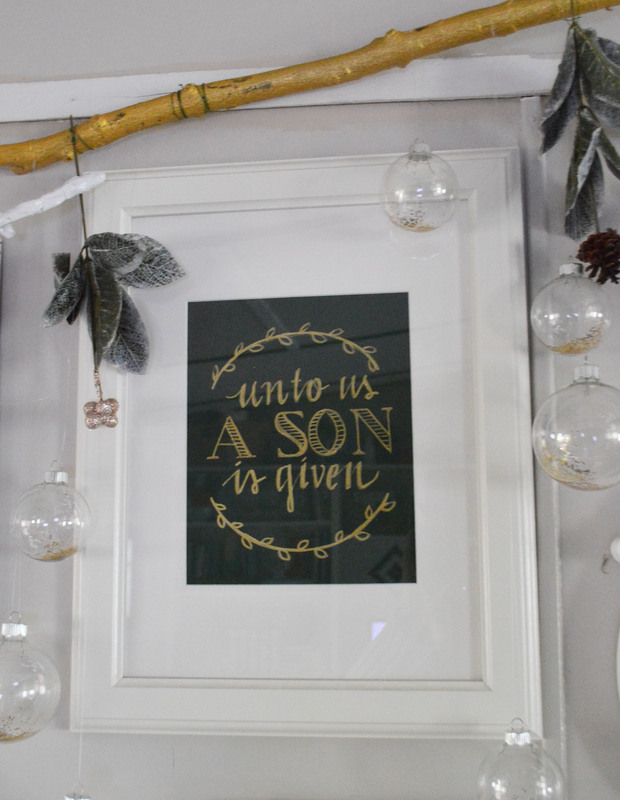 I slapped a coat of metallic gold paint on it, and once again, my husband hung it with two nails and floral wire. 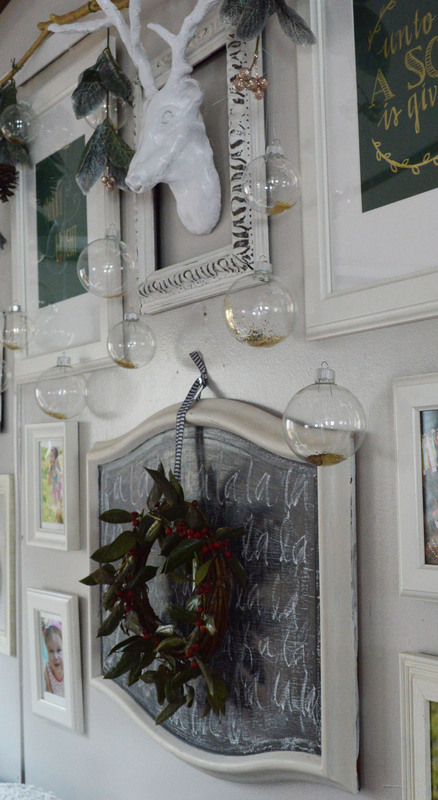 The clear ornaments came from Hobby Lobby (half off); I filled them with gold glitter, hung them with fishing wire, and added greenery left over from this project. I was hoping for something festive without being too over the top. Let me know what you think, and I would love to know if you’re able to use any of these ideas. I’ll leave you with a few more pictures and a photobomb by our Elf on the Shelf (courtesy of my sweet sister)…did you know elves liked cat food? Weird! 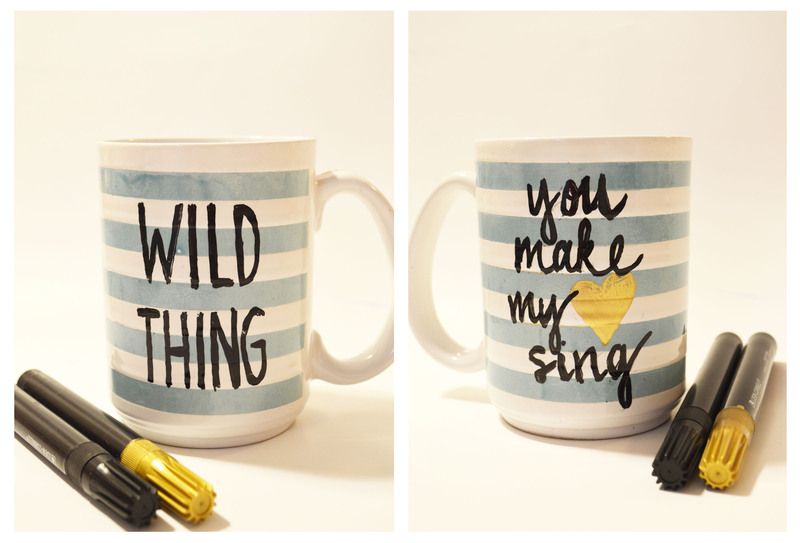 If you’ve ever been on Pinterest, actually I’m going to broaden that category to if you’re alive and breathing, you’ve seen some version of the Sharpie coffee mugs. If you’re a Pinterest addict like me, you’ve no doubt seen at least a hundred versions. In my opinion, they just never get old, and it’s such an easy way to make a great, cheap, personalized gift. Let me humbly offer my own versions, although I didn’t use a Sharpie…more on that later. I will be using my version as a Christmas gift for my son’s teacher. Let me tell you, I seem to regularly strike out with teacher gifts. One year, very shortly after we got our dog, Molly, I bought several bags of those really good Ghirardelli squares to add to the kids’ teacher gifts. Since Molly was so new, I didn’t realize she could climb up the table, so silly me, I left them there overnight. You can guess where I’m going with this, I’m sure; Molly managed to chew through the grocery bag, the bag, and each individual package…she ate four bags’ worth of peppermint bark Ghirardelli squares! 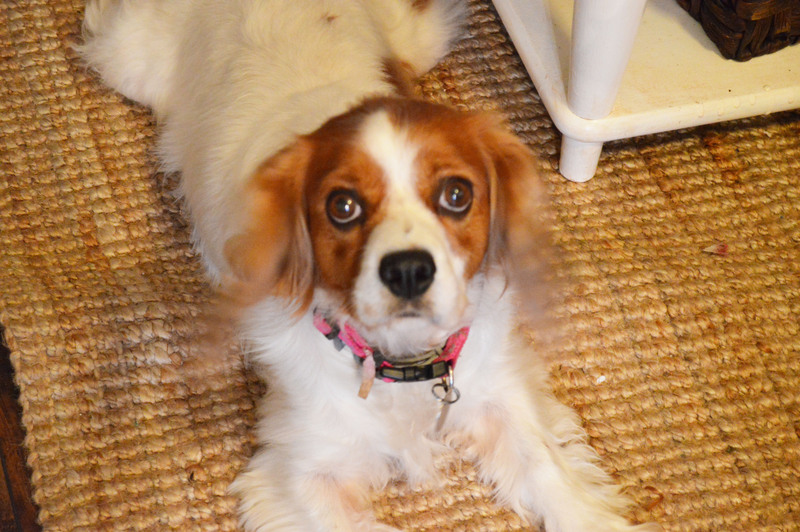 But just look at this face; it’s impossible to stay mad at her for too long. Another year, I bought what I thought were nice candles from Target for the kids’ teachers. Literally two days later, I read an article about great gifts for teachers, which said something like, “teachers want nothing less than ANOTHER candle,” and a testimonial from a teacher about how many candles she had to regift every year. Another fail. 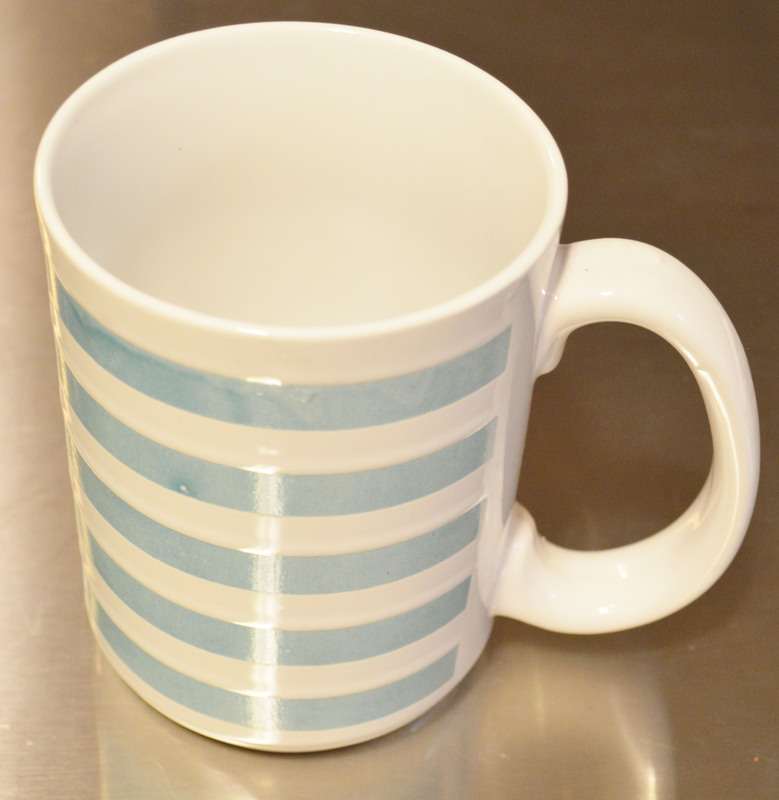 The next year, I was the teacher (of our homeschool), and NOBODY bought me a teacher gift! I know! Shocking. So here goes round 4. 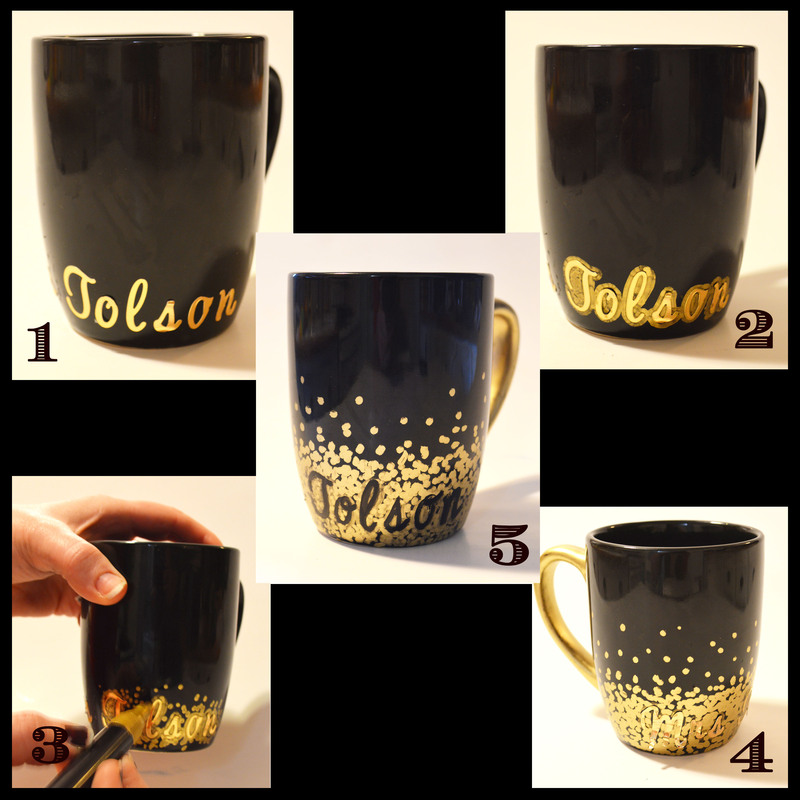 I’m making a personalized coffee cup using a $1 black coffee mug from the Dollar Tree (love that store! ), a $1 pack of alphabet stickers from Walmart, and a $3 Loew Cornell metallic gold glass paint marker from Hobby Lobby (which I have already used for 4 or 5 other projects, so it’s been a good investment). This is the marker, just in case you want to find it for yourself. I used this marker instead of Sharpie, because I have read several places that Sharpie marker designs don’t last long. I have also read that oil based Sharpies work better, but I haven’t had any luck with them. For me, they don’t flow as well. I absolutely love this marker; it flows well and is very easy to use. It’s also relatively forgivable; I had to scratch things off in a few places, and it was fairly easy to get off. First, place your stickers. I think it’s pretty just like this…too bad they don’t make permanent stickers. Second, outline the stickers with your marker to make sure that there is enough contrast around your letters to define them. Third, start dotting away. Make sure you put LOTS of dots around your letters, again for more contrast. Fourth, color the handle with your marker. Let the design dry for about an hour. Fifth, peel your stickers off, and bake in the oven at 350 degrees for 30 minutes. And you’re done! Now I’ve wrapped up the gift with a pretty Lindt chocolate and a cute Starbucks card, and I think it makes a nice little gift. Now to keep it out of the dog’s reach over the weekend! …and tried yet another design with the same marker. Armed with this marker and cute, cheap coffee cups, the possibilities are endless! I would love to see what combinations you come up with, so send them my way! Happy crafting! 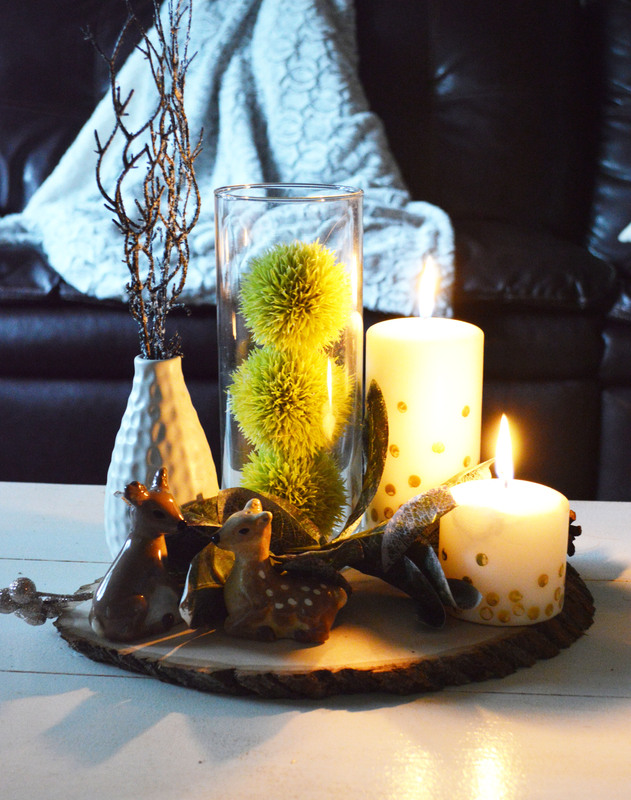 DIY CONFETTI CANDLES…and my first post!! With this post, I do enter the blogosphere. It’s a little scary, but so exciting! Starting a blog has been a dream of mine for a long time, but I just could never find the time with four little ones. I know there are moms who can manage that, but I’m not ashamed to admit that I just couldn’t pull it off. My youngest is finally old enough for me to have a little extra time on my hands, so here it is! This sign was made for me by a very good friend; you can contact her here for a quote. To read more of my story…read this. I don’t usually do much decorating for Christmas, because a) we’re usually out of town on Christmas, b) the aforementioned little ones have kept me too busy, and c) I’ve never fully finished decorating any house we’ve lived in, so I never quite made it to the Christmas decorations. I have this sickness where, when I see something I like, I convince myself that I can make it myself. I have about 3,429 projects going (at least in my head) at any given time. It’s a problem, which will probably drive my husband to an early grave. That being said, this year, since we’re in the trailer, I wanted to do just a few little things to spruce it up a bit. I found and fell in love with some candles from Hobby Lobby, but not with the price tag at $12.99. Since I do live in a trailer, it would be safe to surmise that $12.99 for a simple candle is a little out of my price range. So, once again, I convinced myself that I could do it myself, but this time, I’m glad I did. I would like to share this little DIY trick, which is the easiest DIY project EVER, seriously. (All opinions are the author’s own and do not represent the values of all blogosphere DIYers everywhere…just felt like I might need to throw a disclaimer in there after making such a huge claim). 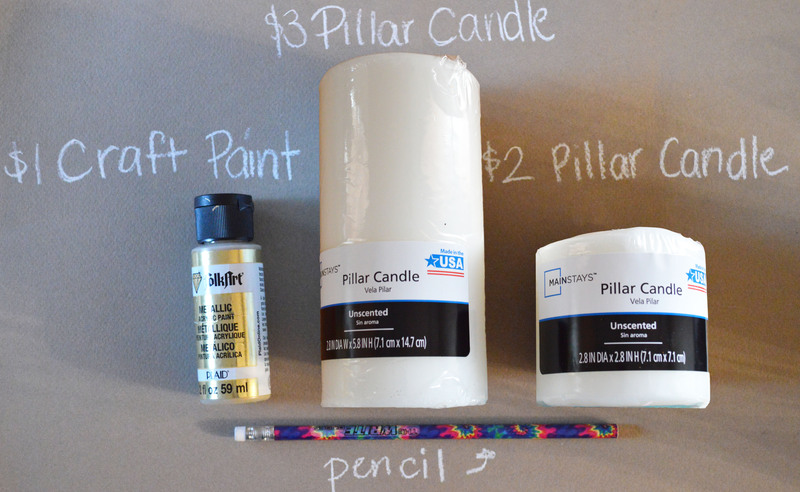 You’ll need pillar candles (I got mine at Wal-Mart for $2 and $3, but I’m sure you could find them cheaper somewhere), gold craft paint (which runs anywhere from .77 to 1.50, and you WILL use it again, trust me! ), and a pencil with a new eraser (needs to be flat). See, I even made you a nice little guide, just in case you don’t know what a pencil is (one should never assume). I kid, but seriously, this project is so easy, I’m almost embarrassed to call it a DIY project. So next, just pour a small amount of paint into a flat dish or paper plate (whatever you have on hand; just make sure you wash your plate right away as the paint dries fast). 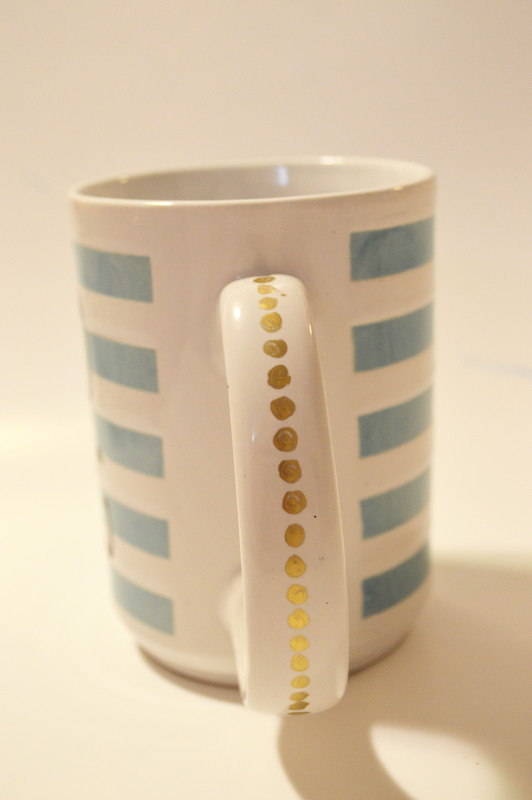 Dip your eraser into the gold paint (don’t overload or it will get gloppy), and dot away at the candle. Don’t worry about getting your “confetti” dots perfect…it’s not even possible, and it will still look great. 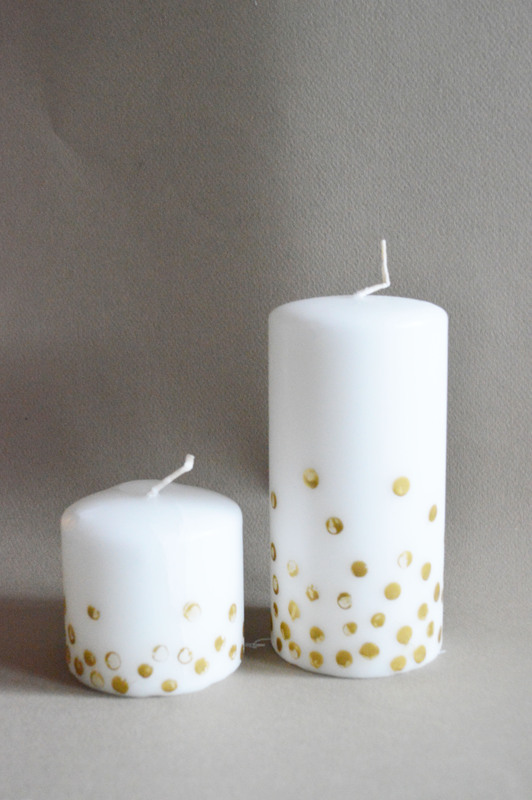 Concentrate most of your dots near the bottom, and taper off once you reach about 2/3 of the way up the candle. Let it dry, and voila! 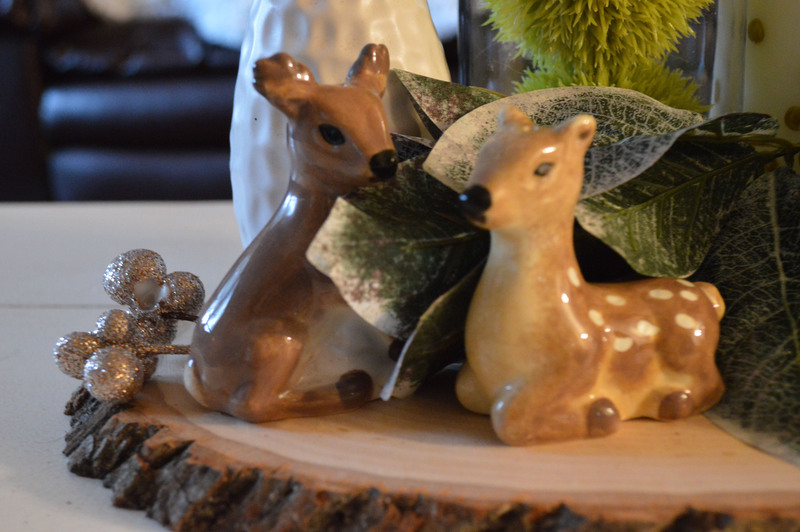 You have a much cheaper version of a really cute candle, perfect for your Christmas décor or to use throughout the year.